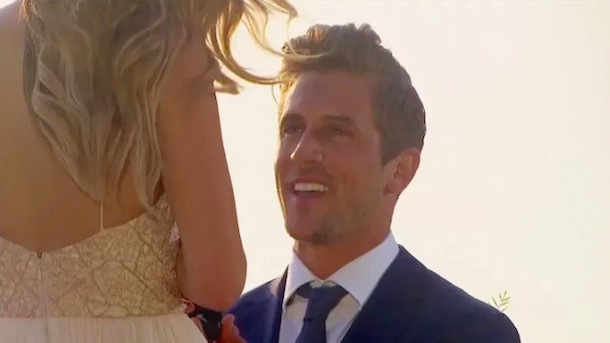 Former Vanderbilt quarterback Jordan Rodgers may not have been drafted by an NFL team, but on Monday night he was selected first overall on The Bachelorette by JoJo Fletcher. So that’s something. Jordan Rodgers—whose brother Aaron Rodgers is more talented, rich, and famous but less good-looking—has been the clearcut favorite to take home the 2016 The Bachelorette Championship from the beginning. He was the first competitor to catch JoJo’s eye, taking home the coveted “First Impression” rose in week one, and over the course of the 10-week season he took home the first rose an impressive four times. Of course, as the Golden State Warriors demonstrated earlier this summer, success in the regular season does not guarantee success in the postseason. And while Jordan was the odds-on favorite to take the Bachelorette title, he still had to come through in the clutch when it mattered most. Early in the Finals it was looking like Jordan might choke away the championship as he dithered over whether or not to call JoJo’s parents to ask for their daughter’s hand in marriage. However, he was eventually able to overcome his jitters and make the call, cementing his #1 status. So what’s next for the Bachelorette champion? Well, while some sources say his “relationship” with JoJo Fletcher may have already tanked, other sources say wedded bliss was never really his end goal anyway. What Jordan Rodgers was really trying to do on The Bachelorette was increase his visibility and land a TV commentating gig. And there are unconfirmed reports that he has accomplished this goal, signing on with the SEC Network. The only question now is, will Jordan be able to repair his rocky relationship with Aaron?